It’s Spring. It’s below freezing out currently. Ice cream, anyone? 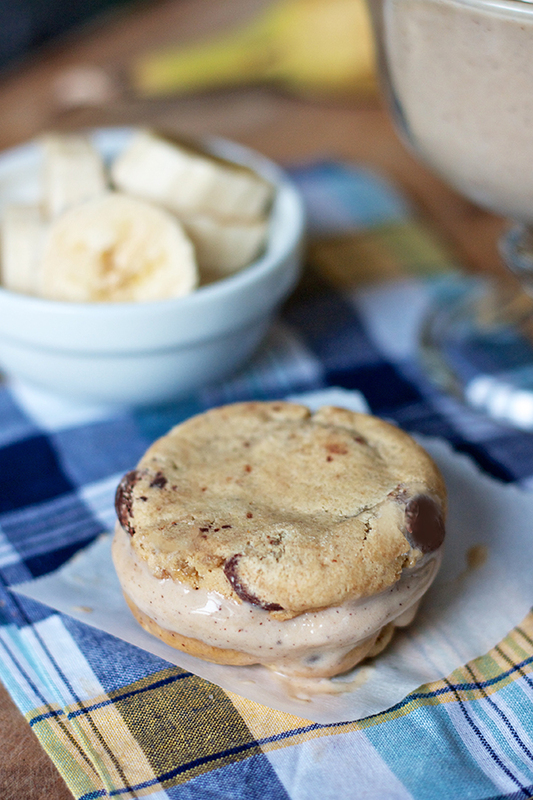 It’s a sick joke, I know, but I promised I’d share this recipe with you a few weeks ago when I talked about the perfect chocolate chip cookie for an ice cream sandwich. When I created an ice cream sandwich bar last month for a dinner party, I went for a lot of warm and homey flavors – soft chocolate chip cookies, roasted banana ice cream, chocolate brownie cookies, salted caramel ice cream, and peanut butter toffee cookies. Complete with plenty of toppings and sauces of course! 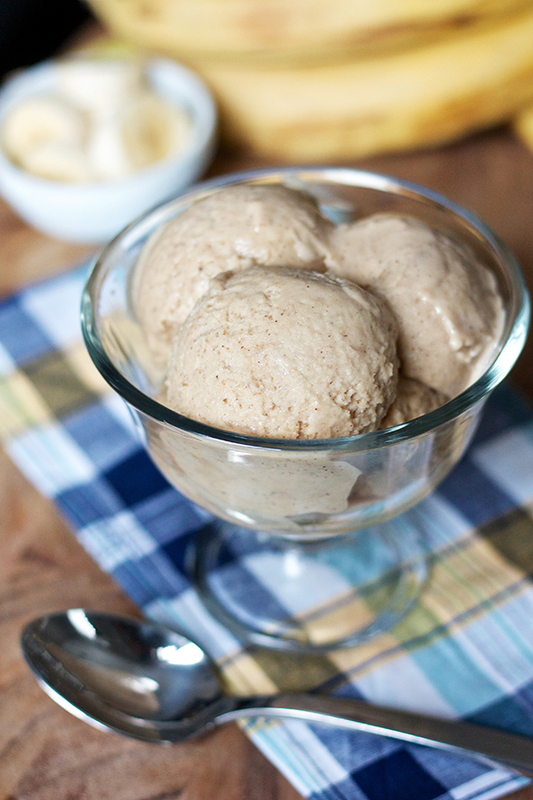 Of the things I made, this roasted banana ice cream was among my favorite. And since it’s egg-free (no custard making this time), it’s so easy to make too! 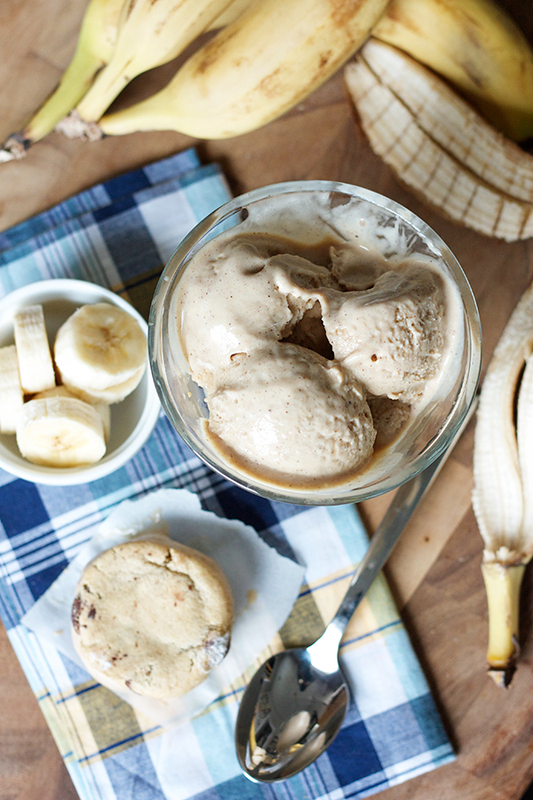 Although it’s easy to overlook banana at the ice cream shop when you’re tempted with fancy things like sea salt caramel and cookie dough pretzel peanut butter crunch (maybe I’ve just dreamed of that…), I am always so pleasantly surprised with how much I enjoy banana ice cream every time I have it. I felt the same way when I made this strawberry banana ice cream a few years ago, and I’ve been meaning to make a roasted banana version ever since. Plus, everyone knows that a frozen banana on its own makes a fantastic “ice cream”, so when you add things like cinnamon, brown sugar, and whole milk, it’s only better from there! The smell after roasting the bananas is so heavenly that it’s hard to resist just eating them with a spoon rather than waiting and letting the ice cream machine do its slow, methodical magic. 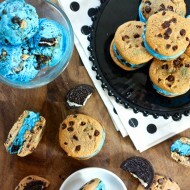 But I’d urge you to be patient, churn the ice cream, make the soft chocolate chip cookies, and create an absurdly delicious homemade ice cream sandwich. Depending on where you live it might be cruel of me to ask you to dust off your ice cream machine when there’s still threats of dustings of snow, but I’m telling you it’s well worth it! Plus, you have to do this before it’s too hot to turn your oven on to roast the bananas. In my mind this is a great transitional baking endeavor because it has the warm flavors of roasted fruit served in frozen form. But I’m hardly the one to judge in this situation – I’ll eat ice cream in forty below! Preheat the oven to 400 degrees. Slice the bananas about 1/2" thick and toss them with the brown sugar, cinnamon, and butter in a large baking dish. 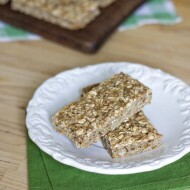 Bake for 40 minutes, stirring once during the baking, until the bananas are browned and the mixture is bubbling. Transfer the bananas and thick syrup into a blender or food processor and add the milk, sugar, vanilla, and salt, and puree until smooth. Chill the mixture for at least 8 hours, or overnight, in the fridge and make sure your ice cream maker is also properly chilled overnight in the freezer. Pour chilled mixture into your ice cream maker and prepare according to the manufacturer's instructions (mine says to let it churn for 25 minutes). Serve immediately or store in the freezer until ready to enjoy. Spring seems a lot farther off than I’d like, but the weather is not stopping me from making spring and summer desserts. I already have a batch of ice cream under my belt from last week. 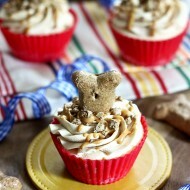 This looks delicious – I’d love to smash it between some peanut butter cookies!